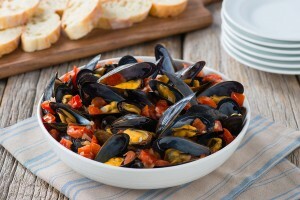 Mussels over pasta or rice make an inexpensive appetizer or main course. Here they are served as an appetizer, each one covered with a spoonful of heavenly tomato wine sauce. If you do plan to serve this with pasta, double the sauce so you have extra for the pasta. Scrub the mussels under cold running water, pulling off the “beards” with your hands. Put the water in a large pot, add the mussels, cover, and place on a burner with the heat turned off. Melt the butter in a medium-sized saucepan. Add the onion and sauté, stirring over medium heat for 2 minutes. Stir in the garlic, sauté for 30 seconds, then add the tomatoes. Turn the burner under the mussels on to high. Cook the tomatoes for 2 minutes, then add the wine and salt and pepper to taste. Quickly bring the tomatoes to a boil and boil for about 5 to 8 minutes, until the sauce is as thick as you like. Stir in the parsley and keep the sauce over very low heat. Meanwhile, steam the mussels for about 6 to 8 minutes, until they’ve opened. Discard any that don’t open. Arrange the mussels on serving plates. Spread the shells slightly, or break off the empty half, and spoon some of the sauce over each mussel. Serve at once.